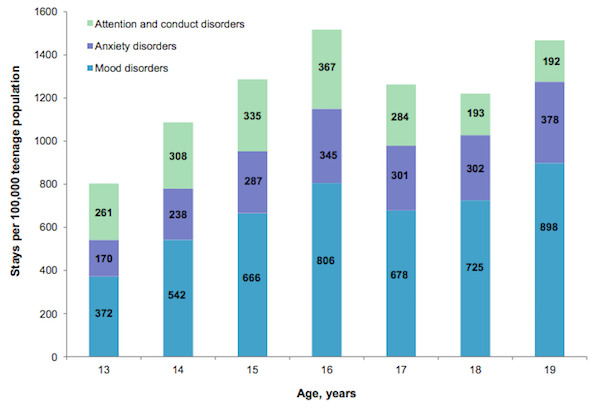 Notes: Data are on the top three mental-disorder diagnoses and are from 2012. Mental-disorder diagnoses are based on any principal or secondary (all-listed) diagnosis or external cause of injury or poisoning. Teenagers are defined as ages 13 to 19 (inclusive). Data Source: Agency for Healthcare Research and Quality (AHRQ), Center for Delivery, Organization, and Markets, Healthcare Cost and Utilization Project (HCUP), Kids’ Inpatient Database (KID), 2012. This entry was posted in Medicine and Society Data Watch on April 6, 2016 by Genevra Pittman.